K & F Computing Research Co. 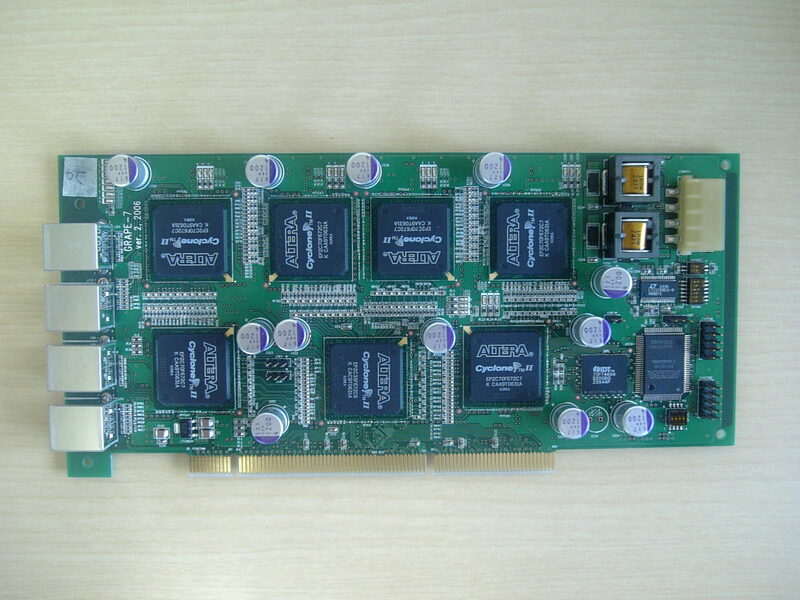 The high-end model of GRAPE-7 add-in card with four Altera CycloneIII EP3C120 FPGA (reconfigurable) devices. Pipelines for calculation of interactions, such as gravity, can be implemented into the devices, so that the card works as an arithmetic-computation accelerator. 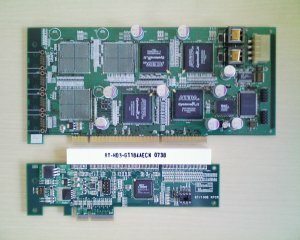 Adopts 16-lane PCI Express as an interface to the host computer. A pipeline for gravitational-force calculation (equivalent to GRAPE-5) is bundled. Its user library has an API compatible with that of conventional GRAPEs including GRAPE-5 and previous models of GRAPE-7 (Model100/300/600). Users of these hardwares can seamlessly migrate their own application codes. Users can design their own pipelines with a pipeline-designing utility PGPG21. 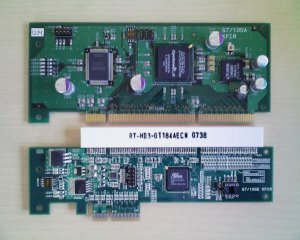 FPGA devices can be reconfigured from the host computer. Operational clock frequency of the pipelines can be adjusted from the host computer, without resynthesis of the logic design. 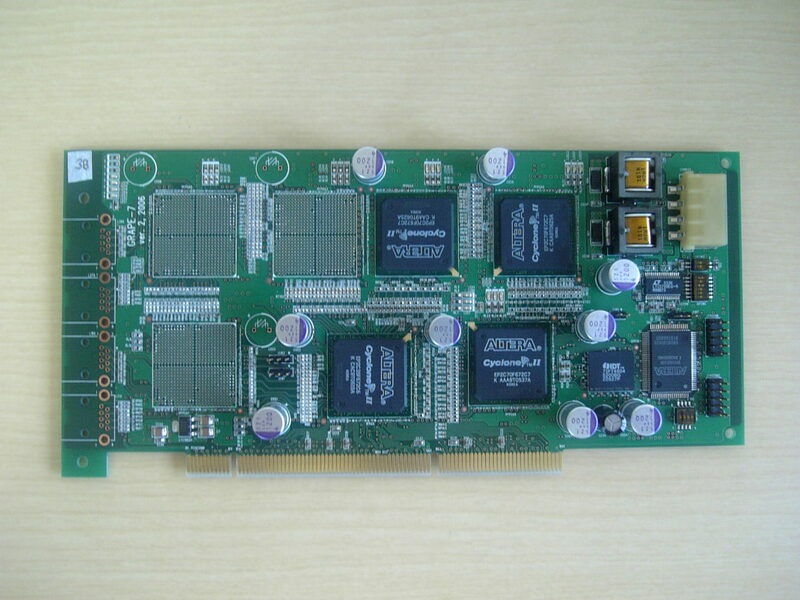 The host computer communicates with the FPGAs via a transparent PCIe switch and PCIe/PCI-X bridges. 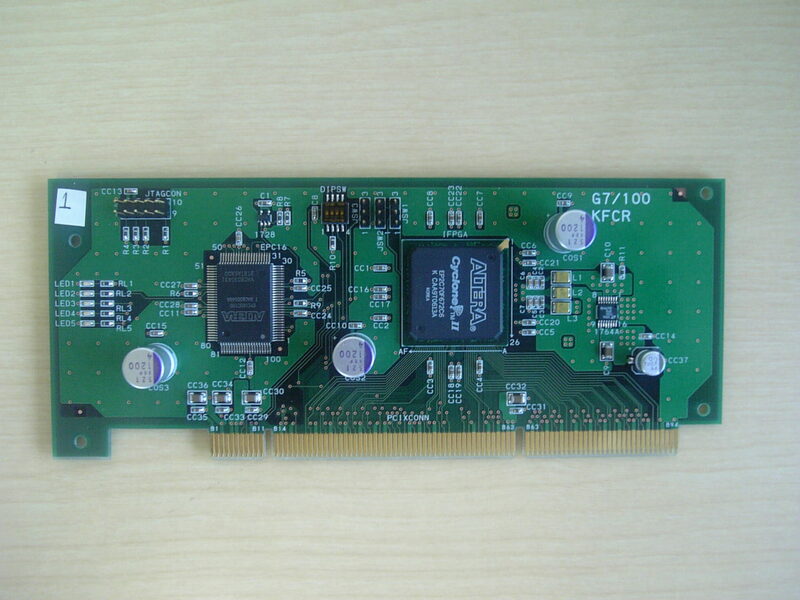 The device driver and the data-transfer library handles these FPGAs as four independent PCI-X devices. Via the user library, a user can handle the four FPGAs as four independent devices, or as a single device. A user library (with source code). A device driver for Linux (with source code). GRAPE-7 Installation Guide for installation and set up. Included in the software package. G5PIPE User's Guide: for GRAPE-5 compatible backend logic. Basic usage, sample codes, and library reference. Included in the software package. G5nbPIPE User's Guide: for GRAPE-5 compatible backend logic with neighbor-particle search function. Basic usage, sample codes, and library reference. Included in the software package. Initial Technical support for 3 months. A GRAPE-5 equivalent pipeline for gravitational-force calculation is bundled. Its user library has an API compatible with that of conventional GRAPEs including GRAPE-5 and previous models of GRAPE-7 (Model100/300/600). Users of these hardwares can seamlessly migrate their own application codes. A pipeline-designing utility PGPG2 generates VHDL sources for all logics including those of pipelines and an interface to the host (except for the PCI-X core). All softwares including the device driver and the user library are provided with source codes. Using these sources, users can evaluate CycloneIII EP3C120 and 16-lane PCI Express. Astrophysical simulation using GRAPE-7 selected as one of 2006 Gordon Bell Prize finalists. Interaction pipelines (such as gravity) implemented in Altera's FPGA (reconfigurable device) Cyclone II. 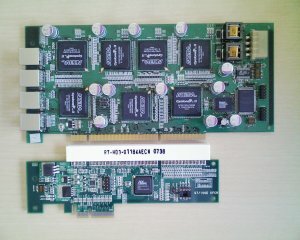 1: In order to generate a bit-stream data (the final product of a pipeline design to be written to FPGA devices), PLDA's PCI-X IP core is required. For GRAPE-7 users who do not have the core, we offer a free-of-charge service to generate the bit-stream data.